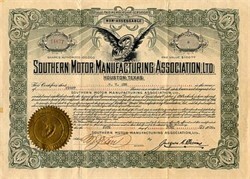 Beautifully engraved certificate from Southern Motor Manufacturing Association, Ltd. issued in 1920. 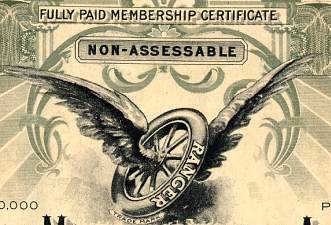 This historic document has an ornate border around it with a vignette of an early wood spoke tire with wings with the name "Ranger" ( Probably the company's logo ). This item is hand signed by the Company's President and Secretary and is over 83 years old. The company made the early Ranger automobile from 1920 - 1922.